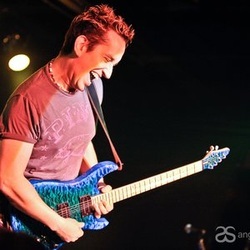 Eric Johnson/Neil Zaza Melodic Lick - . :Shred Tricks - Shred Guitar Lessons by Eric Maldonado:. Here is an awesome Eric Johnson and Neil Zaza inspired lick. It starts off with the classic EJ Root, 5th, 3rd major triad going up diatonically, and finishes off with a fantastic melodic line that can be used as a finisher, or a lead in. You can use a number of techniques here instead of straight picking like I did, you can try to hybrid pick the triads going up to get that signature EJ sound. Also, I didn't do it in the example but, if you add a slight pinch harmonic on the very last note on the 15th fret E, you will get that classic EJ finisher.